Rotary Club of Carlisle - welcome! Please scroll/swipe down through this page to find out more about us, in addition to the pages linked in the menu, top-left. 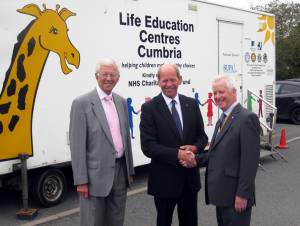 The Rotary Club of Carlisle have provided a substantial amount of support for Life Education's appeal for funds to buy a new mobile classroom. The Movember prostate cancer campaign are asking people to grow moustaches to show their support for the cause. 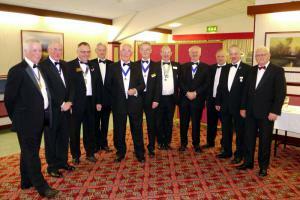 The Border is the monthly magazine of The Rotary Club of Carlisle. It contains news, reports of past events and the whole of our future programme. Please click 'DETAILS' below and then 'LINK' to see The Borderer. Thank you. Since the Rotary Club of Carlisle was founded in 1922 we have raised over a million pounds for charity. The Club was responsible for setting up The Talking Newspaper for Carlisle & District. The Club was also the driving force behind the building of the Eden Valley Hospice. 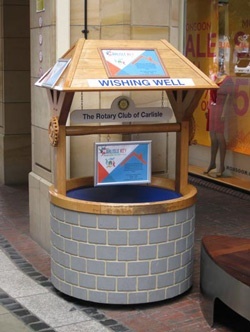 Carlisle Rotary Club's Wishing Well which raised £2,500 in 2017.